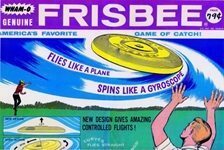 Okay, the Frisbee wasn’t born in the 1950s. But what good is a thing if nobody knows about it? In 1948, Walter “Fred” Morrison and Warren Franscioni, set upon the task of making a toy based on the metal pie tins people had long enjoyed throwing. Since the metal tins had problems, their idea was – plastics. Both men had been Army Air Corps pilots in World War II and Morrison was shot down. He was kept in the notorious German was camp, Stalag 17. They developed the “Flyin’ Saucer,” named because of the craze of UFOs and Roswell. It was for all practical purposes, what you know today as a Frisbee. But it didn’t sell well. In financial trouble, Franscioni returned to active duty service in the Air Force. Here’s where the story gets a “he said – she said” turn. We know that Fred Morrison began marketing the “Pluto Platter” by himself. And apparently he was still collecting royalties for the “Flyin Saucer.” And they were of course, the same item. I’ll leave the moral judgements to you. ds named Rich Knerr and Arthur “Spud” Melin noticed the toy. Who were these guys? They were the founders of Wham-O and eventual creators of the Hula-Hoop. They bought the thing from Morrison.And they renamed it. As the story goes, flinging pie tins was great sport at Ivy League colleges, especially at Yale. There the Yalies would shout “Frisbie,” to warn bystanders of an incoming disc. 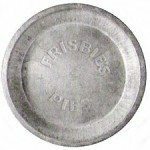 The Frisbie Baking Co. in Bridgeport, Conn. was the source of the pie tins. Sales were moderate at first but then a good thing happened for them – the Sixties! 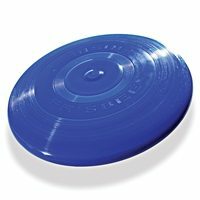 If you didn’t live during the Sixties, I cannot adequately explain what an essential piece of counterculture paraphenalia the Frisbee became. But I bet Wham-O’s sales records would.